Buy Biotta Organic Carrot Juice 500ml in the UK from our online shop or directly from our independent Scottish store. This traditional juice is rich in natural beta-carotene/ provitamin A. Vitamin A helps maintain good eyesight. We sell real Biotta and other Juices & Soft Drinks directly from our shop in Scotland and online throughout the UK. View more products from Biotta. Where can you buy real Carrot Juice - Organic safely online? If you are wondering where you can buy Biotta Organic Carrot Juice 500ml safely online in the UK, then shop with us. 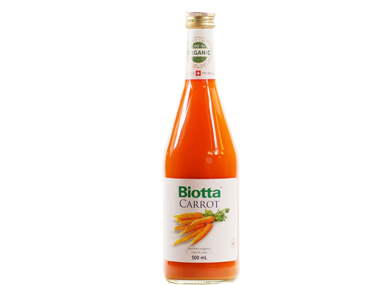 Carrot Juice - Organic - Biotta Organic Carrot Juice 500ml in Juices & Soft Drinks and Drinks.